This small article will contain some info on the history of the Sturmgewehr 44. There are many books written about the Sturmgewehr (see the literature section), so here the history in a nutshell. To understand the history, we must first take a look at the ammo, and not the rifle itself. so the weapon and ammunition designers started working on a new rifle cartridge. After some experiments, this finally lead in 1941 to the approval of the so called "7,92 Infanterie Kurz Patrone" (infantry short cardridge). firing rate between 360 and 450 rounds p. min. and the Walther modell, the MKb. 42 (W) was ready a month later. Below some pictures are shown. Note: these are 1/6 scale models. fired from a closed bolt. As can be seen, both models also had the bayonet lug. This was dropped in later models. impressed, and disapproved the further development of the weapons. Despite the disapproval of Hitler, weapons were send to the Infantry School in Döberitz for evaluation. The Infantry School favoured the Haenel design, and was very enthousiastic, but had some improvement suggestions. This also meant the end of the Walther design. Hitler however, continually refused to see the advantages of the Maschinen Karabiner . His idea was that the infantry needed self-loading rifles which fired the standard 8 x 57 ammo and more submachine guns. Nevertheless, the development of the new weapon continued and now fired from a closed bolt. On February 6, 1943 the improved MKb. 42 (H) was demonstrated to Hitler again. Again Hitler declined the weapon in favour of the adaptation of the Gewehr 43. He ordered that the MKb should not be produced and all work on the project had to be halted. Once again, this had little effect, and 1500 MKb's (or MP 43 A) were to be sent to the front to Heeresgruppe Nord for trial purposes. Why the open-bolt MKb. 42 (MP 43 A) was ordered instead of the closed-bolt MP 43 B is unkown. On April 10, 1943 the Army High Command informed Heeresgruppe Nord that 2000 MKb's had been send. tried to persuade the Führer once more on September 30, and October 1st, 1943. Finaly he was succesfull, and Hitler changed his mind and ordered production of 30,000 MP 43's per month. Since the open-bolt version was rejected, the closed-bolt version got the name MP 43/1. 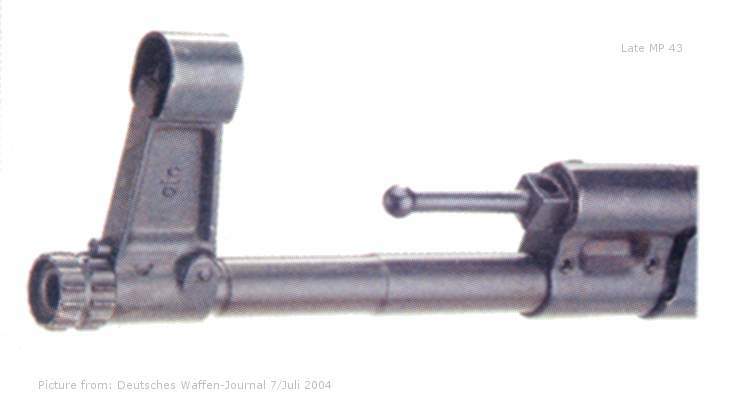 The MP 43/1 had a straight, unstepped barrel, but then it was ordered that it could adapt the standard G. Gr. Ger. 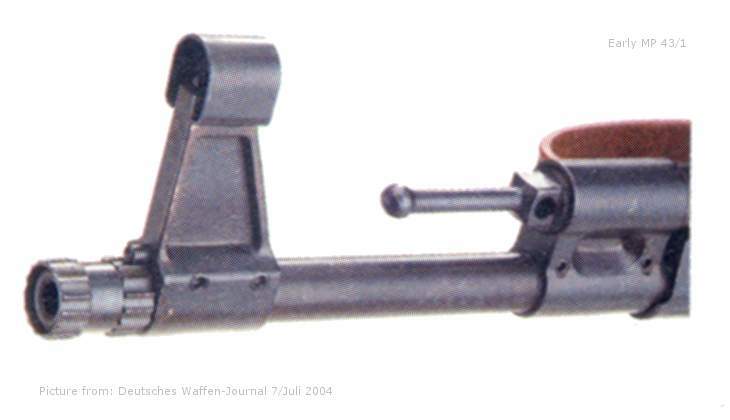 Rifle Grenade Launcher (Gewehr Granat Gerät), so the barrel was stepped down and the front sight was redesigned. In April 1944, the MP 43 was renamed to MP 44, but there were no significant changes to the weapon. the already collapsing German Third Reich.